The puppets are packed away, costumes are back in storage and the stages dismantled. But the smiles on the faces of the local people are still seen across the city and the recent Harmony World Puppet Carnival, held for the first time in Bangkok, is the only topic of conversation. The success of the festival is a reminder that people from all over the world are stirred by the same fundamental passions. You'd think that the modern world, where we carry films, comedy and culture around on our phones would render puppets on strings, dancing dolls and age-old tales as passé. But every show at the Carnival was packed – heroes were cheered, villains booed and young and old alike were awed by the puppets and ingenuity of the puppeteers. 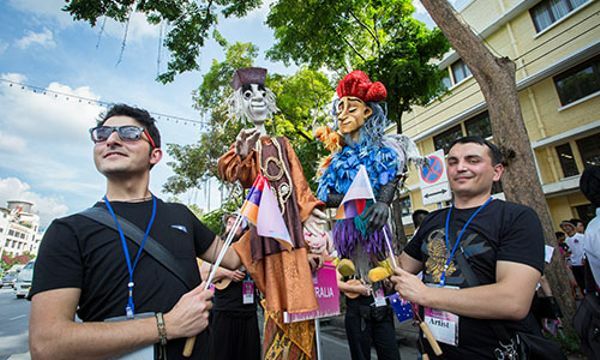 The Harmony World Puppet Carnival (held 1-10 November, 2014), was the largest international gathering of puppets (and their owners) ever brought together with more than 150 puppet troupes from over 70 countries represented. Shows were held all over Bangkok and puppet lovers agreed that Thailand was the perfect venue. Thailand has a rich tradition of puppetry, from courtly dramas played out by exquisitely made marionettes, to shadow puppet shows, with characters cut from cowhide and taken from village to village. For centuries, Thailand's best known epics and folk tales; such as, the Ramakien were passed down through the medium of puppet shows. So the Carnival was a timely reminder that these traditions and skills need to be preserved. The interest of the public was piqued from the start, thanks to a colourful parade from Maha Jessadabodin Pavilion to the main stages at Sanam Luang. This fun procession was made up of the performers and their mesmerising creations, ranging in size from a few inches, to huge marionettes that towered over the crowds and required several operators. The main events took place around the landmarks of Rattanakosin Island. The National Gallery, Theatre and Museum all provided stunning backdrops for the shows and to ensure that the Carnival reached out to everyone, Siam Paragon hosted events so that office workers and shoppers could get their fix of the fun. Sanam Luang staged the biggest shows – the beautiful backdrop of the Grand Palace, with its glittering spires and towers added to the theatre. Culture lovers and tourists waited with anticipation for each act and those who had chairs were soon outnumbered by people crowding the wings, happy to be a part of this huge event. The kids loved it. Even a generation raised on the Internet and special effects found something magical about the moving dolls and mannequins who seemed so eerily human. The first few rows were made up of children of all nationalities, eager to volunteer or content to gaze in wonder. And there were wonders to see. Among the shows this writer saw were a magical dancing couple who turned out to be one talented and flexible Russian artiste (when he stood up for his applause jaws dropped); a ten-foot devil from Iran that required audience participation to subdue; snakes, lizards turtles and dragons from Vietnam and even a 6-inch doll from New Zealand who was able (thanks to skilful manipulation from the puppeteer) to draw a tiny portrait of a delighted audience member. Vietnamese troupe, the Vietnam Puppetry Theatre took advantage of the evening dusk to stage a mesmerising celebration of rural life. Black clad figures, barely discernable to the audience manipulated costumes and puppets, and we got to see scarecrows moving supernaturally across the stage while chickens, with human hands for feet danced and laid eggs. The Harmony World Puppet Carnival educated people in exhibitions and workshops about puppet traditions from all around the world. The wonderful and distinctive Ratchadamnoen Contemporary Arts Centre, hosted an exhibition about Thailand's distinctive puppet types as well as films and videos about puppets in art and culture. The event came to a glorious finale on 10 November when puppets and performers took their last bows. Everyone had fun and the legacy of the carnival should be felt for a long time to come. It has been a reminder that even in an ultra-modern world, we're ready to suspend disbelief for a while to enjoy exquisite craftsmanship, fine storytelling and interact with otherworldly creatures. Surely this is something worth preserving.